It’s been a long, cold, snowy, rainy winter. Spring is taking way too long to get here. Everyone wants to get away. How about April in Paris? (On my bucket list.) I know. I know. April weather in Paris isn’t the greatest, but it IS the City of Light. The Eiffel Tower, Louvre, Versailles, Champs-Élysées, pâtisseries, people watching in Parisian cafes, French night life, wine at Baron Rouge, French food . . . ahhh sign me up right now. Oh well, for now I’ll settle for good wine, crusty bread and maybe an indulgent, silky chicken liver mousse or pâté. What? You say you’ve never had chicken liver? Just because you don’t like the sound of it? Too bad. You’re missing something wonderful. Chicken livers are an inexpensive indulgence, easy to prepare and above all don’t taste like liver. They’re earthy flavorful, yet mild and sweet tasting. Simply sautéed with onions and mushrooms then tossed with pasta you have a lovely dinner. Surely, at parties you’ve had chicken livers wrapped in bacon haven’t you? How about a chicken liver pate made with wine or port? Any Jewish deli worth its salt has chopped chicken liver on the menu. . . Anyway, this is all leading up to today’s recipe. 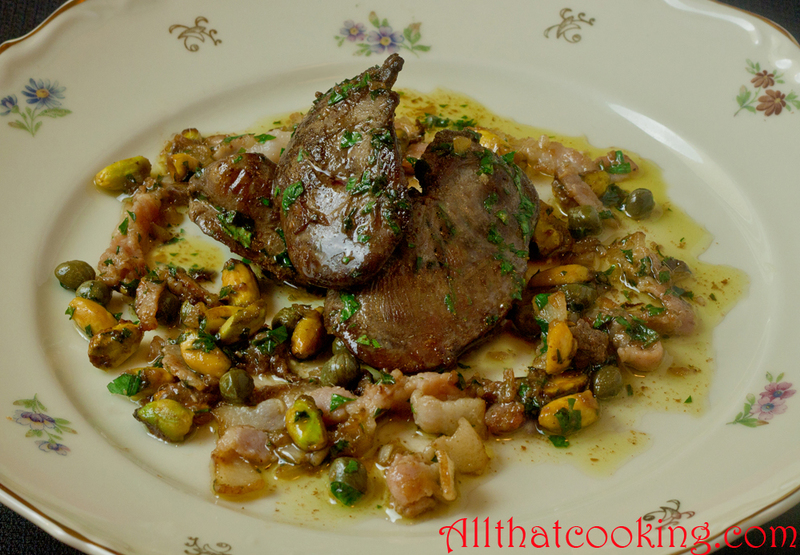 Oli’s wine marinated chicken livers with pistachios. I think it’s a great introduction to these tasty little bits. Just marinate them overnight in red wine and olive oil. When you are ready to serve they are sautéed in butter and olive oil then joined by some onions, bacon, capers, some finely chopped anchovies, parsley and for a surprise little crunch, some pistachio nuts. It takes just a few minutes to prepare this classic French dish. 1. Trim fat and connective tissue from livers then rinse in cold water. 2. Mix wine and olive oil in large bowl. Add chicken livers and use your hands to coat them with the marinade. Cover with plastic wrap and refrigerate overnight. 1. 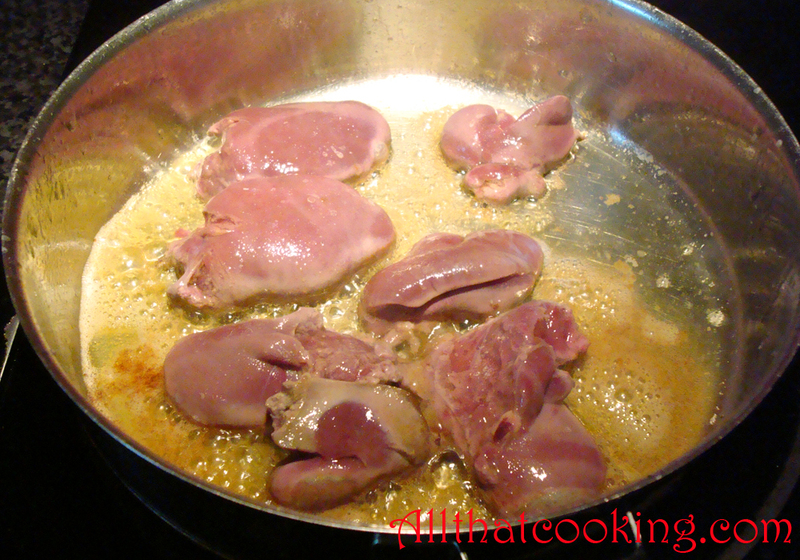 Remove chicken livers from marinade and pat dry. 2. Heat olive oil and 2 tablespoons of the butter in a large skillet over high heat. 3. 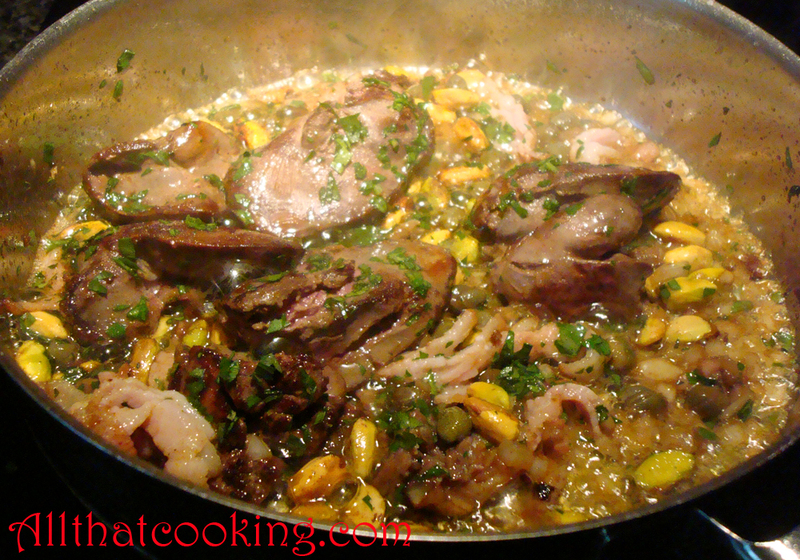 When sizzling, decrease heat to medium high and drop in livers. When they begin to sweat after about three minutes turn them over. 4. Toss in onions and bacon and fry until golden colored. 5. 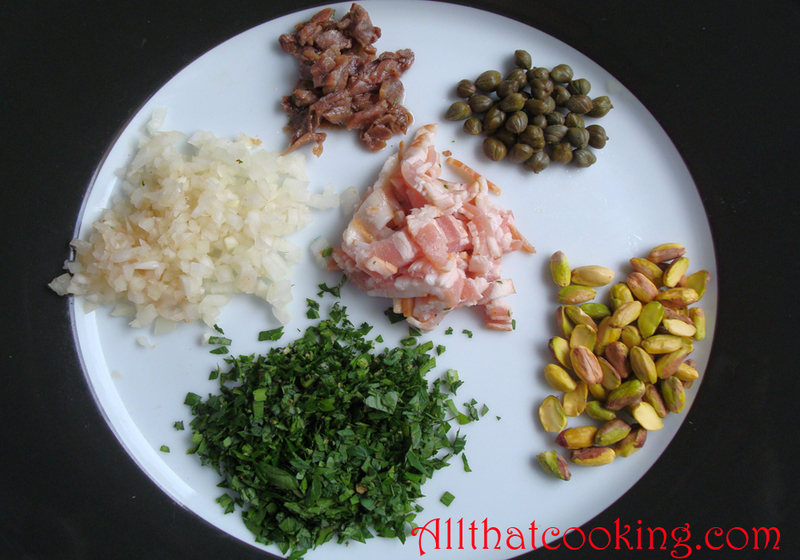 Strew in capers, pistachios, anchovies and parsley. 6. Drop in remaining butter and gently stir to distribute. Serve with crusty bread and a glass of red or even better with a sweet ice-wine. Château d’Yquem would be Oli’s perfect choice, but not for the wallet! I say instead try a Sauternes if you want sweet. Then again, champagne is always nice. Gallery | This entry was posted in Appetizers, Starter and tagged chicken livers, classic French chicken liver preparation, marinated chicken livers, pistachios, sautéed chicken livers. Bookmark the permalink. We have a really warm winter this year and the spring has sprung really early too. Today it reaches 23C in the mid-afternoon. We have a really cold summer this year and the fall has sprung really early too. Today it reaches -23C in the mid-afternoon.